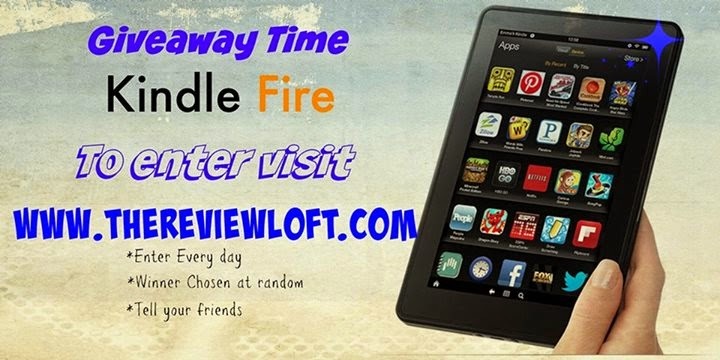 The Review Loft : Who wants to win a FREE Kindle Fire? For the launch of our new blog, the ladies of The Review Loft are giving one lucky winner a Kindle Fire! To enter, visit us at our blog, Facebook, Twitter, Goodreads, and Pinterest. You also have a chance to enter daily just by tweeting about us! Contest ends on January 16th and the winner will be announced on Monday, January 19th. Open to US residents only. Hey! Congratulations on the launch!! Hi! *waves* Welcome to the world of bloggers! You know we rule the world right? lol! Thanks for the awesome giveaway! Congrats on the great blog!!! Hi, thanks for the chance! I am a SAHM of 4 wonderful kids (ages 18, 15, 10 & 8). They keep me pretty busy sometimes and I have to squeeze in reading time when ever I can, usually late at night when they are all in bed. LOL! Random facts... I am addicted to Flaming Hot Cheetos, Mt. Dew and Ian Somerholder (I mean, c'mon who isn't addicted to him right? lol). Hi and good luck with this blog. Hi and Congratulations on your Blog Launch!! I'm a stay at home wife and mother of three wild boys. Love reading and discovering new authors and books. I'm enjoying following your blog! Thanks for this great giveaway!! Congratulations on your new blog!! Congrats! I'm always excited to find another great book blog to follow. I like vlogs and video reviews. I'm Bethany and I also blog @ Lit Slave.